Part of the advantage of living in Chiba, as I do, is the proximity to golf courses. But living out there still doesn't make me immune to the dreaded morning and afternoon traffic jams that greet all golfers! To counter this several golf courses offer night golf, which is the perfect antidote to traffic not only on the roads but on the course itself! 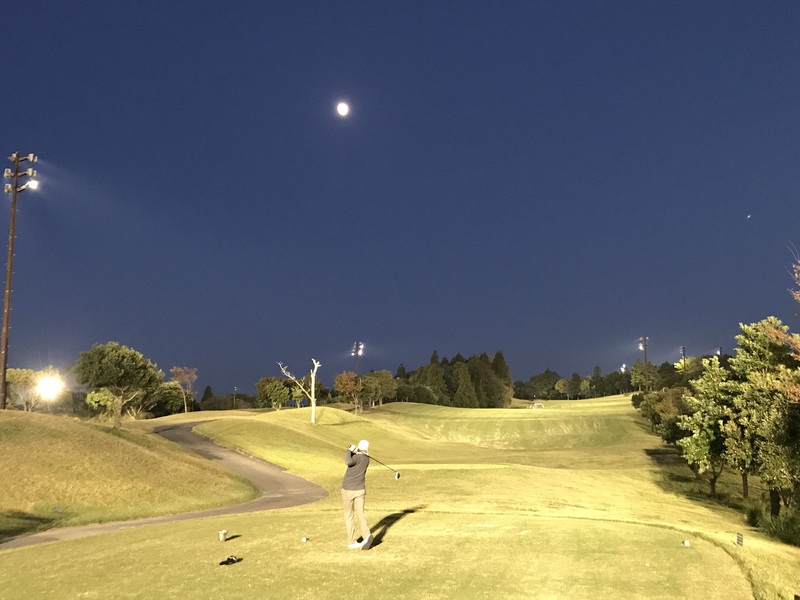 Playing night golf in Japan is like playing golf overseas: you drive there in 30 minutes or less, get right on to the course, and play-through in under 4 hours, and head back home. What's not to love? Well, I can hear the naysayers asking about lost balls. But I can honestly say that I lose fewer balls at night than I do during the day. More about that later. One night golf course I highly recommend is Moonlake Ichihara. There are 3 Moonlake courses, and they all offer night golf, but Moonlake Ichihara is probably the easiest to get to from Tokyo. The Ichihara course is a challenging course from the back tees, but quite a fun course from the white tees, so it's good for all levels of golfers. There are several beautiful holes with bridges that span over water and creeks. Perhaps the nicest hole is the picturesque 13th hole with three water hazards! At night, when it is all light up, it is magical to look at. For those new to night golf, the long and short of it is, you can see your ball very easily under the bright lights, even from far away. In fact, I tend to see it more easily at night simply because the glare from the sun is gone. The hardest time is around dusk when your eyes take time to adjust to the sun, but on the plus, it's stunningly beautiful to play under the gorgeous red and yellow autumn skies. In summer it is particularly nice to play after the heat of the day is gone. Around this time of year, a long sleeve shirt or a jacket is recommended for cooler nights. Because Ichihara is far enough away from the bright city lights of Tokyo, the stars are quite visible depending on which night you go. The course condition is good, however, the greens take the most damage since they only have 8 hours to heal on any given day. But they are by no means in bad shape. Keep in mind, at night, the ball slows down and judging the distance on greens becomes slightly trickier. But you can generally get used to it after a few holes (secret, my playing partner and I increase the gimme zone to a club length at night!). The final hole is a long par 4 leading back to the clubhouse, which almost plays like a par 5. But once you get back, the night staff is relaxed and easy going. If you are a keener and booked 26 holes, they'll just wave you on through again! On that note, you have to pay before you start since the front desk will be closed. Moonlake Golf Club is one of 6 golf clubs in the PGM golf group that offers night golf. Ichihara play fee rates for night golf varies from ¥5,000~ on weekends and ¥10,000~ on weekends.